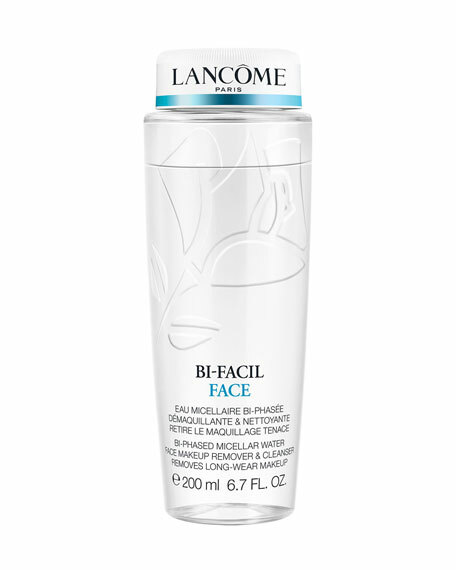 Lancome Bi-Facil Face, 6.8 oz. Bi-Phased Micellar Water Face Makeup Remover & Cleanser removes long-wear makeup. Bi-Facil Face dissolves even the most stubborn long-wear face makeup and cleanses the face,leaving skin feeling fresh. Bi-Facil Face incorporates the unique bi-phased characteristics of Bi-Facil eye for gentle yet effective makeup removal. The oil and micellar water phases of Bi-Facil Face offer long-wear face makeup removal and full facial cleansing using a cotton pad. The oil phase dissolves makeup, while the micellar water phase cleanses and removes excess residue. Bi-Facil Face leaves skin feeling instantly cleansed and refreshed. A bi-phased micellar water face makeup remover and cleanser. Bi-phased formula, removes long-wear face makeup, no rinse formula. Shake gently before using to mix both phases together. Deposit the product on a cotton pad by soaking it generously. Apply the cotton pad on the face to remove makeup and impurities.